A longtime favorite with sushi connoisseurs legend known citywide, says the San Francisco Chronicle "Ebisu offers fresh sushi served in a festive environment. Ebisu is one of Japan's seven deities of good fortune and is usually depicted carrying a sea bream (a symbol of good luck) under his left arm and a fishing rod in his right hand. The restaurant's space is standard sushi-bar decor, with bright lights, light wood tables and chefs standing behind a long sushi bar. The traditional menu features nigiri such as ruby-red tuna topped with flying-fish roe and barbecued eel atop sticky rice. Besides raw fish, there is the usual array of tempura and sukiyaki entrees, as well as salmon, chicken or beef teriyaki. "The yellowtail, sea urchin and sweet shrimps are excellent, the last served with their tempura-fried heads," says Gayot (guides). 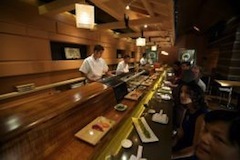 San Francisco Chronicle: "Slip into the sushi bar and let the sushi chef create a magical meal for you. Exquisitely fresh fish, good chicken teriyaki."